Southwest Virginia has become a tourist destination for many reasons—scenic mountains, heritage music, farm-to-table restaurants, and Appalachian culture, just to name a few. But many people are passing through on a much larger journey: Hiking the Appalachian Trail. Thousands of hikers each year set out on the 2,200-mile long trail that connects Springer Mountain in Georgia with Mount Katahdin in Maine. Of course, not everyone is taking the full trek across the country. The Appalachian Trail is filled with scenic sections that make for excellent day and weekend hikes, attracting people from across the country. For long-distance hikers, hitting Southwest Virginia is a mixed blessing: It is indeed considered one of the most scenic sections of the trail, following both ridges with sensational views and tree-covered wilderness. You’ll find the wild horses of Grayson Highlands and Damascus, Virginia, known as the "friendliest town on the trail." But with those highlights come the unavoidable fact that you’re in for a lot of climbing. The trail crosses the state line from Tennessee into Virginia at an altitude of 3,302 feet, and from there it’s up and down along the 167 miles of trail that go through the region. You’ll hit the highest point of Virginia, Mount Rogers—technically just off the trail, but not by much—at an altitude of more than 5,700 feet, along with many several other high points along the route. Of course, these climbs are also part of the fun, especially for day hikers who aren’t covering the full 550 miles of the trail that go through Virginia. For those looking for for the best of Appalachian Trail experience in the state, here are some must-hit sections in Southwest Virginia. Damascus is one of the most popular trail towns on the AT. It also features several other regional trails that are good for day hiking, including the Virginia Creeper Trail. Those doing the full AT hike look for hiker-friendly towns along the route, and Damascus as become known as one of the best. Travelers on the AT will find restaurants, laundry facilities, a post office, pharmacy, outfitters, plus several hostels and B&Bs where they can take a break. For day hikers, Damascus is also the epicenter of several opportunities for exploring the region, as seven major trails pass through the town. In addition to the AT, you can access the Virginia Creeper Trail, the Trans-America National Bicycle Trail, the Iron Mountain Trail, the Daniel Boone Heritage Trail, the Crooked Mountain Music Heritage Trail, and Virginia’s Birding and Wildlife Trail. You’ll also find loads of recreational opportunities in the adjacent to the Mount Rogers National Recreation Area. Loop Hike on the Appalachian and Iron Mountain Trails : From Damascus, start on East 4th Street and the trailhead to the Iron Mountain Trail, which is blazed with yellow markings. After about two miles, you’ll find a short, blue-blazed connecter trail, which will connect you to the Appalachian Trail (with white blazes). The return trip over a ridge features excellent views of the city. You’ll also enjoy some easy stream crossings and some manageable climbing. Loop Hike on the Appalachian and Virginia Creeper Trail : Once again, start in Damascus for this 8-mile, easy-to-moderate hike. Start heading east on the Appalachian Trail/Virginia Creeper Trail. Follow the signs for the Appalachian Trail when they separate after you cross Route 58/91. Here you’ll enjoy the ridged view for about four miles, before you’ll cross a small log bridge and turn right on the Beech Grove Trail, where you’ll descend over about a quarter mile to the Straight Branch Virginia Creeper Trail parking lot. From there, you can hop on the Virginia Creeper Trail and head back into town. Damascus is also home to the annual Appalachian Trails Days festival each May, which brings nearly 20,000 outdoor enthusiasts to the town each year to take advantage of workshops, outdoor outfitters, food, and entertainment. The trail to Mount Rogers offers some of the most stunning views in the region. 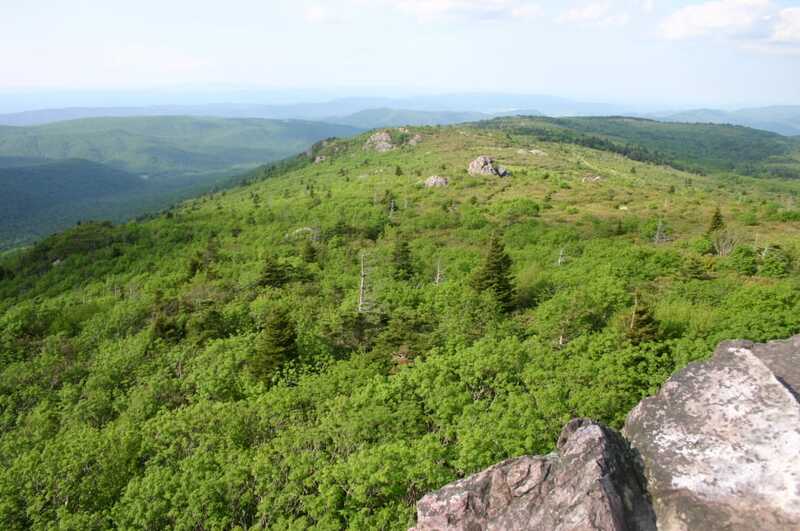 You can reach Virginia’s highest point with a very scenic but challenging nine mile, out-and-back hike, mostly on the Appalachian Trail, which starts at Grayson Highlands State Park. While it’s great to reach the summit, one of the draws of this hike is viewing the wild ponies that live in the area. They help keep these bald mountains bald—that is, without significant tree cover—by eating the grasses and underbrush, which also is helpful in preventing wildfires. It also means that you get excellent panoramic views as you ascend the trail. Start at Massie Gap in the state park, where you’ll pass through a horse gate and begin going up on the wide, gravel path. It isn’t long before you’ll reach the Appalachian Trail, which heads south and takes you most of the way to Mount Rogers. The wide open terrain is much different from the rest of the Appalachian Trail in the region, with little tree cover, rocky terrain and exposure to the elements. The final spur to the summit leaves the Appalachian Trail, where you enter a fairly thick evergreen forest. There’s a marker on the top of the mountain, but no view to speak of. This is truly a case of the journey being better than the destination. For those looking for a hike even more off-the-beaten path, Burke’s Garden is one of the more interesting geographic formations in the state features a section of the Appalachian Trail that doesn’t get a lot of day hikers. Located near Tazewell, Virginia, Burke’s Garden is a low valley surrounded 360-degrees by mountains. From above, it looks as if massive being pushed a finger down and created the valley, which has lead to the area’s nickname as "God’s Thumbprint." The lush valley is a throwback to another time, occupied mostly be family farms. The Appalachian Trail wraps around the ridges, and while it is mostly tree covered, you do get a few gaps that allow for some spectacular views. For those not on a thru-hike, however, this section of the trail isn’t widely promoted. You won’t find signs for the trail in Burke’s Garden, which is made up almost entirely of private farmland. The easiest way to access the trail is through an entry point at Walkers Gap, which is located in Burke’s Garden. From there, take the trail (mostly uphill, with some significant climbs) for a bit over a mile to get to Chestnut Ridge and the stone shelter at the top. The trees open up and you’ll find excellent views of the valley below. Continue on the trail along the ridge to extend the hike. Chances are, the only hikers you’ll meet will be those doing either the full trail or at least a multi-day trek through the state. Of course, these are just some of the options. Nearly any section of the trail offers something for day hikers to enjoy. And it won’t take long to figure out why so many thru-hikers view Virginia as the most scenic section of this 2,200-mile trail. Written by Jeff Banowetz for RootsRated in partnership with Southwest Virginia.